Exhibition Schedule: The Art of Institute of Chicago, Chicago, IL, November 12, 2013-January 27, 2014; Amon Carter Museum of American Art, Fort Worth, Texas, February 22, 2014-May 18, 2014. 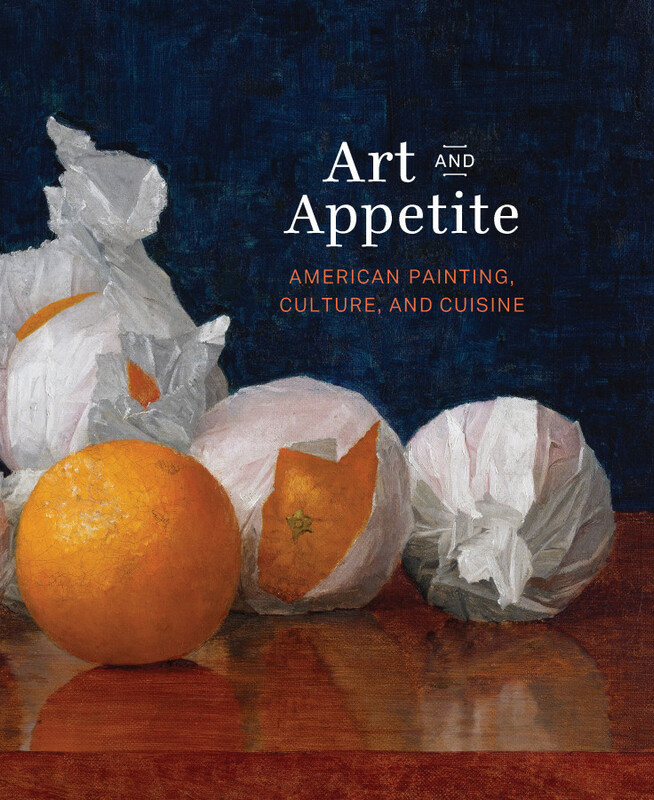 In the book Art and Appetite: American Painting, Culture, and Cuisine, readers learn how American artists from the 1760s through the 1960s forged a deep connection between art and food. Artists depicted all aspects of food cultivation, preparation, and consumption because food was generative ground for portraying and reflecting upon American society. This point is laid bare in eight chapters arranged thematically and chronologically by Annelise Madsen, Sarah Kelly Oehler, Ellen Roberts, and Judith Barter, who conceived the project and exhibition of the same title. The authors present original research as well as historic recipes collected from the preeminent archives on American food and dining. Art and Appetite, as a result, is one of the few books that would fit naturally on both a library shelf and kitchen counter. While the book provides stunning, high-resolution photographs of nearly 100 artworks, its greatest service is showing how food is not merely a source of nourishment but an object of symbolic value that participates in the construction of American identity. The authors of Art and Appetite invite readers to contemplate the social ramifications of food and derive meaning from America’s culinary and aesthetic palettes. Judith Barter spearheads this conversation with an introduction entitled, “Food for Thought: American Art and Eating.” In this section, Barter demonstrates the direct influence of diet on American art by examining how colonial painters depicted the vegetables and berries commonly planted in kitchen gardens, while later artists painted the beer and cider available in local taverns. Oyster bars and saloons also inspired the subject of American paintings for they were important backdrops to political debates and cultural exchanges that occurred around tables of food. The national implications of food are more humorously illustrated in the 1876 “porcineograph”: a map of the United States outlined by 25 pigs trotting around a border listing the pork specialties of each state. Above the map is a picture of three hogs engaged in dinner and conversation underneath the United States motto “e pluribus unum,” translating to “out of many, one.” Even in 1876, Americans understood that food, specifically meat, unified the nation. Of course, food also reinforced stratifications in society, creating divisions between Americans of different races, religions, genders, and classes. This introduction establishes the centrality of food to the development of American identity. Barter devotes the first chapter of Art and Appetite to America’s most lively culinary tradition: “Thanksgiving: The Great American Food Fest.” This subject bore particular significance for the exhibition, which opened just two weeks before Thanksgiving at the Art Institute of Chicago. Moving from political cartoons in Harper’s Weekly to pictures of comical turkeys by Roy Lichtenstein, Barter traces the pictorial evolution of this holiday since its legitimization in 1864. Barter also applies a more critical eye to Thanksgiving by investigating its racial undercurrents in art and school programs that functioned to assimilate immigrants in America to the “shared values of nationalism, freedom, home and family” (46). Norman Rockwell’s painting from 1942, Freedom from Want, embodies these values by portraying an American family gathered around a Thanksgiving meal of turkey, celery sticks, and plate of Jello. This humble meal stood as an emblem of patriotism during World War II when food rationing was in place. Rockwell’s use of white tablecloths, white plate-ware, white curtains, and, significantly, white people to represent this national holiday is also emblematic. Barter’s inquiry into race and Thanksgiving provokes readers to question who is pushed beyond the margins of Rockwell’s picture plane and excluded from mainstream visions of this national holiday. In the second chapter on “The Symmetry of Nature”: Horticulture and the Roots of American Still-Life Painting,” Barter and Annelise Madsen continue to probe how food shaped a national identity. This exploration begins with the eighteenth-century portraits of John Singleton Copley, whose depictions of glossy apples compete with shiny textiles for the viewer’s attention. The authors reveal how homegrown fruits and other objects of cultivation were powerful symbols in early American paintings that represented ideas about wealth, fertility, and democracy. Barter and Madsen specifically locate the epicenter of artistic and culinary wealth in Philadelphia, where the influential Peale family experimented with foods in soil and in still lifes. Paintings of watermelons, sweet potatoes, and other foods alien to the chilly climate of Philadelphia display innovations in hothouse technology that enabled the Peales to cultivate these foods outside their natural environment and season. The appearance of food next to Chinese sugar bowls and European decanters in still lifes also displayed advancements in trade and the wide commercial reach of America by the nineteenth century. In discussing the mobility of food and food objects across countries, climates, and seasons, Barter and Madsen emphasize the global character of early America at this time. Madsen plots the changing landscape of food and dining in the book’s third chapter, “Recipes for Refinement: Art and Sociability in the Mid-Nineteenth Century.” Here, Madsen reveals how American ideas about refinement were shaped by the invention of the dining room, a new space in the mid-century home reserved for eating and socializing. In this room, eaters were expected to rehearse all the rules and tools espoused by etiquette experts in manuals. Artists such as Lilly Martin Spencer contemplated the rules of etiquette in genre paintings like Shake Hands? from 1854, which features a smiling housemaid extending a handshake covered in flour from the food she prepares on a kitchen table. This painting coincided with widespread stories about immigrant maids failing in the kitchen and poisoning American families. Spencer’s picture also pressed upon concerns over immigrant maids usurping the role of American housewives in the kitchen. With all the anxiety surrounding food, Madsen asserts that rituals of dining instilled a sense of order in the home and “drew sharp distinctions between those who ate and those who served” (88). Madsen investigates the “sociability” of dining in this chapter and its intervention in American art. Although Madsen captures the complexities of taste and refinement in America, she misses the opportunity to discuss sugar and its divisive role in shaping these constructs. Sugar, after all, was a controversial food in the mid-nineteenth century and a target of boycotts against cane sugar and other foods produced by slave labor. The politics of sugar thus raises questions about paintings in the third chapter, including Hannah Brown Skeele’s still life of cubed sugar painted in 1860 on the brink of the Civil War. Lilly Martin Spencer’s painting of a woman stirring molasses in Kiss Me and You’ll Kiss the Lasses from 1856 displays another controversial sugar product deemed unclean for its production by slaves and association with the lower classes. Perhaps Madsen skirted this issue because exhibitions such as Sugaring Off: The Maple Sugar Paintings of Eastman Johnson at the Clark Institute (Williamstown, 2004), Sugar and the Visual Imagination in the Atlantic World from the John Carter Brown Library (Rhode Island, 2013), and Home Front: Daily Life in the Civil War North at the Newberry Library (Chicago, 2013) recently treated the subject. The scholarship of Sydney Mintz (New York, Penguin Books,1986), Wendy Woloson (Baltimore, Johns Hopkins University Press, 2002), Kay Dian Kriz (London, Paul Mellon Centre for Studies in British Art, 2008), and Lawrence Glickman (Chicago, University of Chicago Press, 2009) have also addressed the politics of sugar. Madsen’s chapter, nevertheless, would benefit from a deeper consideration of sugar and the labor systems that supported the culture of taste. In the fourth chapter entitled, “Drunkards and Teetotalers: Alcohol and Still-Life Painting,” Barter examines how artworks depicting alcohol offered rich cultural commentary. Colonial paintings of rowdy sailors sharing punch bowls of rum deviate from later paintings of naturally fermenting grapes and untouched glasses of wine that suited more temperate tastes. An interpretation of William Michael Harnett’s 1891 painting, Just Dessert, most poignantly reveals the cultural meanings endowed in representations of alcohol. What might seem like a celebratory still life of exotic objects actually displays all the gloomy trappings of a sick patient, including grapes—a common ingredient used to treat bronchial infections; coconuts—a cooling remedy for inflammatory diseases; Maraschino liquor—a popular tonic; as well as Smyrna figs—a laxative to treat kidney stones. Barter suggests that Harnett, who suffered from kidney failure, might have painted these medicinal ingredients to comment on his own ill health. Illness was a fitting subject for still-life paintings that historically addressed human mortality through representations of skulls and rotting fruit. Such interpretations demonstrate the importance of contextualizing food and alcohol in American art and the possibilities that emerge when studies of art and food collide. Chapters five and six explore how artists used food to tackle the subjects of immigration, industrialization, and other social changes and conflicts accompanying the turn of the century. The fifth chapter by Barter on “Masters of Taste: Trompe L’Oeil and the Politics of Food” specifically examines trompe l’Oeil paintings of hung potatoes and plucked chickens that served as haunting metaphors for conflicts concerning Irish- and African-American communities. While this analysis resonates with the scholarship of Alexander Nemerov (Berkley, University of California Press, 2001) and Ross Barrett (New York, Art Bulletin, 2010) who have dissected the bodily violence and racial politics of still-life paintings, it overlooks scholarship by Martha Evans that exposes how issues of gender penetrated trompe l’Oeil painting (Manchester, Hudson Hills, 2004). Ellen Roberts adds to the conversation on food and social change by examining the role of industrialization in the sixth chapter, “Anxious Consumption: Paintings of Food at the Turn of the Twentieth Century.” Roberts considers how William McCloskey’s still life of oranges shuffling in tissue paper celebrates the new technologies and packaging materials used to ship fruit across the country. Still lifes of slimy, undecorated fish by William Merritt Chase, in contrast, may advocate a return to simpler, preindustrial diets. At a time when standardized products such as Coca Cola, Heinz ketchup, and Aunt Jemima pancake flour were invented, the topic of industrialization naturally infiltrated paintings of food. These two chapters probe how American artists at the turn of the century used food in creative ways to respond to social change. While most of Art and Appetite grapples with representations of food in the nineteenth century, the text closes with two chapters by Sarah Kelly Oehler interpreting twentieth-century artworks of food. In the seventh chapter “From Tabletop to Table: Food and Eating in the Modern Era,” Oehler argues that artists in the twentieth century favored still-life representations of food because the genre lacked overt narrative, showcased the objects of everyday life, and provided the perfect opportunity to deconstruct space, form, and surface. The cubist interiors of Max Weber and flattened tabletops of Marsden Hartley explicitly demonstrate how still lifes of food were used to reinvent tradition and experiment with pictoral construction. This intense focus on modern form, however, did not supersede artists’ deep contemplation of food and its role in American society. Oehler reveals how painter Luigi Lucioni pondered the modernization of food by pairing a can of ready-made condensed soup with more organic foods in Still Life with Telephone from 1926. A discussion of Edward Hopper’s Nighthawks also speaks to the changing nature of American foodways and the rise of diners that provided streamlined foodfare reflected by the mechanized coffee urns in the painting. This chapter highlights the innovations in painting and cooking that merged in art of the twentieth century. Art and Appetite concludes with Oehler’s analysis of food and Pop Art in the eighth chapter, “Convenience: Pop, Production, and the Making of Art in the 1960s.” It is not surprising that food appeared regularly in Pop Art since the processed and brightly-dyed foods of the time period excited artistic sensibilities in color, material, and form. Oehler draws upon Andy Warhol’s multiples of Campbell’s soup cans and Wayne Thiebaud’s canvases of frosted cakes to illustrate the inspiration that Pop Artists found in the graphic nature of food. The large-scale models of vinyl green-beans and hand-sewn hamburgers by Claes Oldenburg from the 1960s show how food’s sculptural form inspired artists as well. By inflating the size of food or abstracting it to playful shapes and patches of color, Oehler reminds readers how Pop Artists divorced food from its realistic form and exaggerated the “incongruities between the depiction and the actual object” (213). This distortion of food in art mirrored the distortion of food in factories that constructed meat and vegetables from processed materials. Oehler ultimately observes how mechanical reproductions of food circulated in two markets in the 1960s—the art market and the supermarket. The authors of Art and Appetite, in the end, have created a landmark text that demonstrates how food is not merely an accessory in American art, but a social signifier that shapes discourses on race, nationality, modernity, and other constructs central to the formation of American identity. The authors also find social meaning in the ceramics, silverware, and dining rituals that Americans employ when consuming food. For this reason, Art and Appetite would be useful to scholars across the disciplines of Art History, Visual Culture, American Studies, Cultural Studies, Agricultural Studies, and Environmental History. This text is especially timely given the growing number of Food Studies programs in universities across the country and the rise of exhibitions focused on food and still-life representation. Future examinations of food in contemporary times through the lens of photography and performance art would honor the legacy of this book and further nourish scholarly understandings of food and its representation. Art and Appetite thus makes a strong case for considering the material, cultural, and political histories of food and drink in American art. In doing so, readers will discover that representations of food are as rich as the foods themselves.